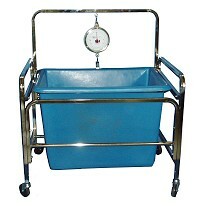 Versatile and durable, our laundry scales are ideal for large or small commercial laundry jobs! Our scales come in a variety of materials; from our wire basket scales and table top scales for coin-op applications to our larger heavy duty nylon and polyethylene (hard plastic) scales and floor scales for industrial applications. We have a scale to best suit your needs. Don’t see what you’re looking for? Please contact our customer service representatives to learn more about our bariatric scales, chair scales, in-bed scales, patient lift scales, and wheelchair scales. All available for quick shipping.